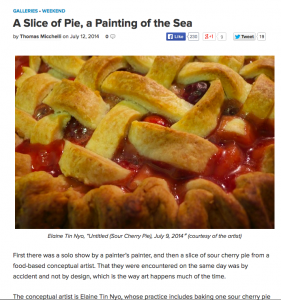 Sour Cherry Pie is an annual art project that is part endurance performance, part journal. 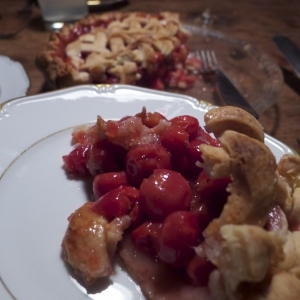 For nearly a decade, I have made one sour cherry pie a day and shared them with my friends and acquaintances. I send an email report to the pie list each time a pie is consumed. The performance lasts as long as the cherry season, about three weeks. It happens in the most intimate of spaces: my kitchen, your mouth, a picnic basket, your table, a park bench, my private email list and an under-trafficked blog. You can read the emails on my blog Nothing Happened Today.